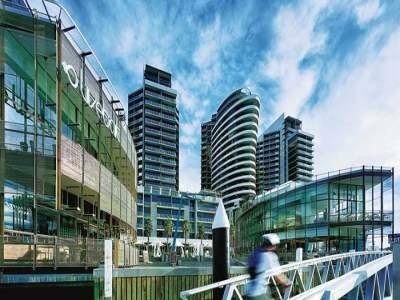 The Accommodation Star Docklands aparments is ideally located in the vibrant Docklands precinct of Melbourne. It is situated on Victoria Harbour, which is only minutes from the CBD, opposite Etihad Stadium and an easy walk to Melbourne's trams, trains and water transport. The 5 Star Docklands Apartments are central to all of Melbourne's major tourist attractions including sporting stadiums, entertainment venues, markets, restaurants, cafes, theatres, galleries and excellent shopping. From the Accommodation Star Docklands Apartments guests can stroll over the Yarra River to the Southgate complex where they will find lots of things to see and do, as well as plenty of fine dining restaurants. So for luxury corporate and family apartment accommodation for long term stays in central Melbourne you should choose to stay at the Accommodation Star Docklands Apartments. It has a range of apartments available which are perfect for both short or long term stays. The Accommodation Star Docklands Apartments are positioned directly opposite the Etihad Stadium and just a short walk from NewQuay with its truly dynamic public space filled with award-winning restaurants, cafes, trendy bars, specialty shops, spectacular urban art and a calendar full of events. Accommodation Star is also an easy walk to the Melbourne CBD and close to Melbourne's major attractions including sports and entertainment venues, markets, theatres, galleries and shopping. For people who love retail therapy Melbourne has funky laneways with hidden treasures, leading international fashion labels, and tree-lined streets are a haven for small boutiques specialising in Australian designers, jewellery and accessories. You will find lots of dining options close by to this discount furnished apartment accommodation, with something for every palate and price range.